The email followed a push last month from the Victorian Young Liberals and the right-wing Institute of Public Affairs to privatise the ABC and SBS. GetUp! was claiming victory after it placed an advertisement in the weekend papers with a picture of the Bananas in Pyjamas in a blender and the words ”ABC safe? Don’t B2 sure”. 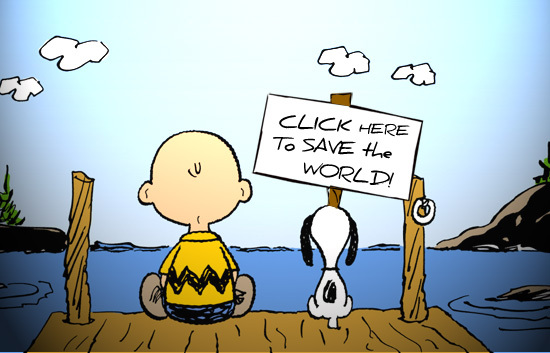 Welcome to the world of ”clicktivism”. The term, coined by journalist Micah White in 2010, refers to the growing trend of online activism – where activists can participate in social movements through their laptops or smartphones. Clicktivism is becoming increasingly popular in this country, but it is time some hard questions were asked about its effectiveness. Australia now has one of the most net-connected populations in the world with more than 80 per cent of the population connected, as well as a relatively free and transparent democratic government and largely uncontrolled internet. This environment has spawned several Australian online activism groups, and we have become a favourite target of international groups such as Avaaz and MoveOn.org. But increasingly, the line between well-intentioned activism and marketing in a highly contested online marketplace has come to be blurred, and the fallout is damaging the capacity of progressive groups to mobilise in the real world. When activism is reduced to online campaigning it must embrace the techniques of mass marketing in order to achieve results – making a disruptive emotional impact on audiences in order to manipulate their habits. That is not necessarily a bad thing, except when the method eclipses the motivation and the political effectiveness of the action is blunted. Despite H&M not having any clothes produced in the Rana Plaza factory, within a week Avaaz had gathered almost a million digital signatures demanding action. Eventually H&M (which plans to open in Australia next year) agreed to sign an accord to make serious financial investments in improving labour conditions for its foreign workers. Unless they engage in community-building actions, produce in-depth campaign research, or provide the opportunity for genuine interaction between activists and campaign leaders, the activists in the world of ”clicktivism” are relegated to the role of being cashed-up sheep: ready to add their name to whatever issue the groups determine to be newsworthy enough. This is activism bound to news cycles, data gathering and emotive taglines – far removed from the urgency and camaraderie of traditional protest movements. By embracing tried and tested methods of delivery of marketing, this kind of activism can have the effect of merely stroking people’s desire to ”do the right thing”, rather than engaging them in meaningful political struggle. In Australia in 2013 we are in danger of allowing progressive movements to descend into indulging the superficial, self-adulating impression of activism, rather than actually posing any kind of tangible threat to anyone. Meanwhile, the risk is that activists become increasingly isolated from one another as they sit behind computer consoles – away from the front lines of affective street demonstrations. It seems increasingly likely Australia will be jolted to the right after the September 14 federal election. In those circumstances, activists will need to be prepared to do more than simply add their digital signature to flashy websites if they want to have a real impact on the political direction of the nation.